ATHENS, GREECE. — The world’s largest airline, American Airlines, will offer a new flight from Athens (ATH) to Chicago O’Hare International Airport (ORD), connecting the two cities for the first time. The summer seasonal flight will operate 4 May, 2019, through 29 September, 2019, and will be flown on American’s state-of-the-art Boeing 787-8 aircraft. Customers travelling from Athens to ORD can choose from 20 Flagship Business seats featuring direct aisle access, lie-flat seats complemented by a range of exclusively designed bedding by sleep experts Casper, chef inspired menus, a new branded amenity kit by This is Ground, the use of premium noise-cancelling headphones and access to American’s Flagship Lounge in ORD where they can relax before their flight with a variety of hot and cold entrees, premium wine, Champagne, and cocktails. The aircraft will also offer 28 Premium Economy seats. American’s Premium Economy experience includes priority boarding, a larger leather seat with 38 inches of legroom, the use of noise-reducing headphones, a stylish STATE branded amenity kit, Casper blanket and pillow, and an enhanced meal service with complimentary wine, beer and spirits. In the Main Cabin there are 186 seats, 48 of those are ‘Main Cabin Extra’ and include additional legroom. Across all cabins, customers can access inflight Wi-Fi, personal inflight entertainment and complimentary beer and wine. In addition to American’s new flight to ORD, the airline also offers a summer seasonal flight from ATH to Philadelphia (PHL). 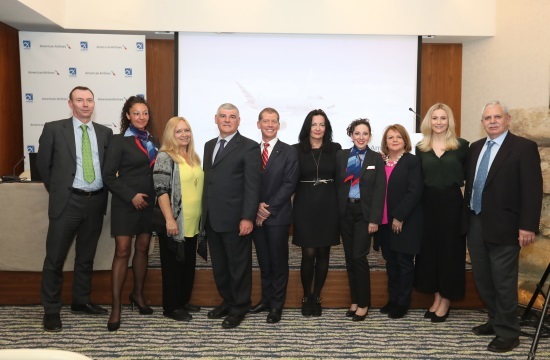 Learn more about American Airlines in Greece.